The Whisper is our modern interpretation of the famed fighting knife of the samurai, the tanto. Designed by Jason Breeden and produced to perfection by Kizlyar Supreme of Russia the Whisper is an exceptional choice as an EDC knife. 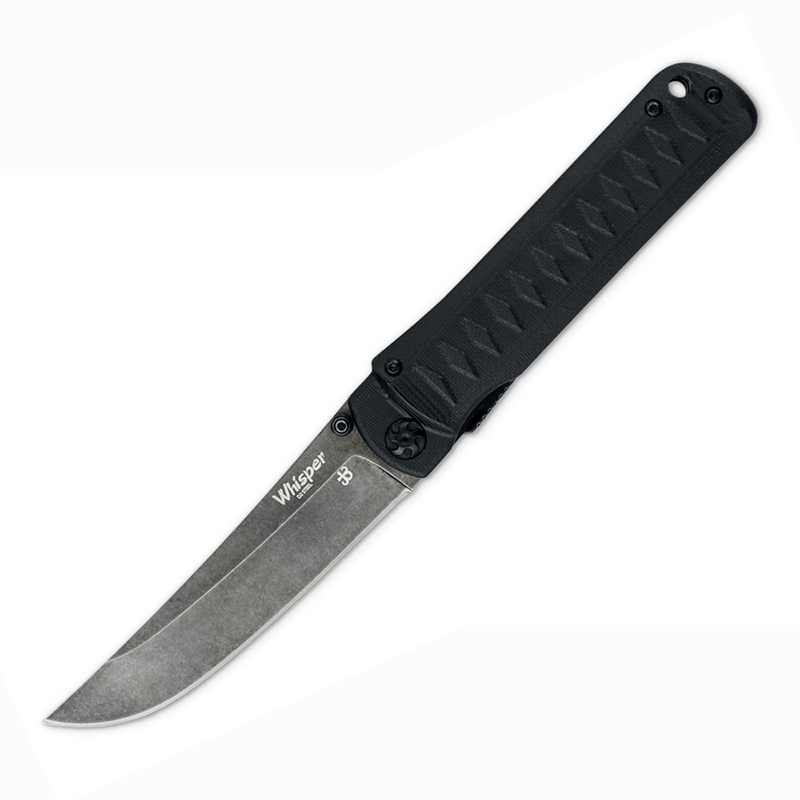 The blade features a true tanto shape, capable of tackling the toughest daily tasks while providing the penetration power lacking in so many “western” tanto designs. The grip is milled G10 with nested stainless liners and features the famous diamond pattern seen in Japanese handle wrapping in reverse. The strong pocket clip rides deep and displays a Japanese Mon, or family crest. These powerful symbols were first used on the battlefields of Japan to distinguish each warring faction. This version of the Whisper features tough D2 tool steel for the blade in a dark stonewash finish and jet black 3d milled G10 scales. PRODUCT DETAILS Key Features: D2 Tool Steel Blade Milled G10 Scales Jason Breeden Design SPECIFICATIONS Overall: 8 1/8″ Blade Length: 3 3/4″ Handle Length: 4 1/2″ Weight: 4.4OZ Blade Steel: D2 Handle Material: G10 Specs will vary slightly from piece to piece.